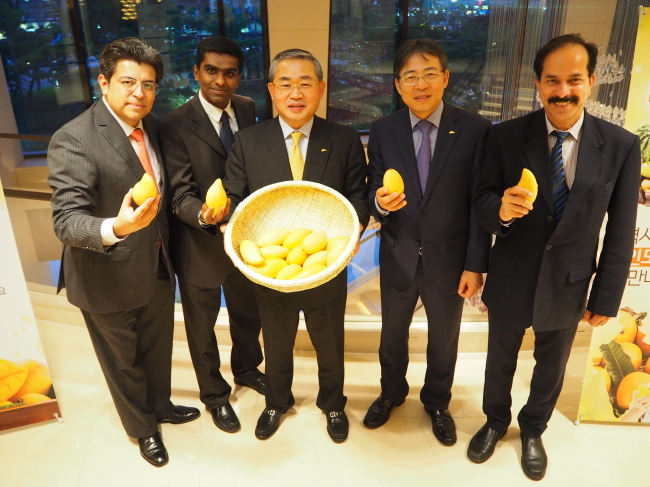 Mangoes from India have been made available in Korea at supermarket chains including Emart. The mango is the national fruit of India, with early varieties grown there some 5,000 years ago. The word “mango” is derived from the Tamil word “mangkay,” and the common fruit’s scientific classification is “Mangifera indica,” alluding to its Indian origin. More than 50 countries import Indian mangos -- famous for their sweet, succulent and pulpy texture and taste -- including the UK, US, Canada, Germany, France and New Zealand. There are more than 1,000 commercial varieties available in India, and mangos are a seasonal delicacy as well as an integral ingredient in Indian cuisine.